It's a garden in a dress! I love! And the suits and blazers! Also to die for. I want! I don't really like harem type pants, but this I would love to have! Scallops + Lace + Cropped Jacket = Yes yes yes! I want a blazer like this. African inspired? Love the color and cut! Alexander Mcqueen's collection continues to inspire. His legacy was continued by Sarah Burton. She just updated what Alexander started and infused his drama in the new designs. The collection is light but still fierce. Perfect for the rainy days. I think. Power dressing. Love the trouser! Women in power. Love this dress! One of my favorite brand is Moschino. Rosella Jardini's design is not for those who wants plain and understated. It's all about pearls and polkas! Polka is so in. Love the sweater! Saw a lot of wide leg trousers. Is it on trend? 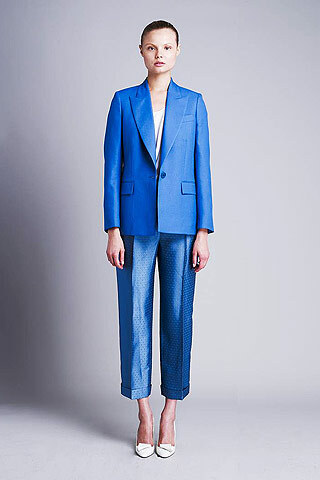 I'm not a fan but this pantsuit is cute! Polka on polka! I want trousers like this! Never thought red and violet mashes well together. For Moschino Cheap and Chic she focused on an uptown girl theme remix. Very Coco Chanel meets L.A.M.B. Love how they styled each piece! I die for the sweater and drawstring pantsuit. The cargo pants and the sweater works well! Cute jacket! Love the silver rings. I want the shirt! So me. Hah! And i want the bag. Make a statement with a huge bow belt. Amazing coat. Looks like the Stella M. one no? Romantic + Preppy + Rocker chic. Hawt. Meanwhile, Miu Miu is all about apples, polkas and stripes! Printed wide leg trousers. Would you wear this? Apples are in? Why not cherries? Last favorite for this batch is none other than: Proenza Schouler. Designs were inspired by Indian art and urban living. Love the prints, the graphics, the clashing of prints and fabric, and how they did preppy. So chica. This is how you do Preppy. Metallic can be wearable too. I must have this black shirt! Works with anything. So there you have it. Saw a lot more great pieces I wanted to share, BUT I didn't want to bore you to death. SO..maybe I'll post another batch soon. :) Now, I'm inspired! im totally digging the scallops right now! me too! and the polka--forever. heehee! i wish i had enough money to buy the entire stella mccartney collection.. it was sooooo cute! this post is just amazing..lots of inspiration. thanks for posting this...when i browse through style.com, i get so overwhelmed with all the designers then i get bored browsing through all the designs...i'm easily distracted like that..hehe. It's so nice to see Stella embracing prints this season it is a great change of pace from her usual collections filled with solids which I too am always obsessed with! the black turtle neck dress is amazing. great fashion eye! 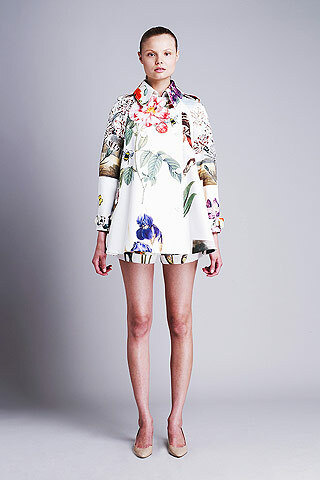 alexander mcqueen's collection is stunning! Great inspiration post Aisa! Cant wait for my scallop shorts now! I love the Mccartney prints!